In August of 2008, I approached A.C.T.’s Melissa Smith about the M.F.A. Program and potential interest in collaborating on an attempt to write a poem-as-play. When I first met with [A.C.T. Director of Academic Affairs] Jack Sharrar and [M.F.A. Program student] David Jacobs[, the project’s director], I knew my vision was not just my vision, but one that David immediately latched on to. My first draft was a series of abstract sketches and dialogues that gave an impression. Almost immediately, David saw what I saw, and over a year of writing workshops he has helped me lead nine actors to unveil, discover, imagine, and create the world of my play, Let It Come, Down. The ingenuity of the entire cast continues to keep me on my feet. Every time I take a risk with language, typography, or staging, the actors are ready with their imaginations to get the words on their feet. Let It Come, Down is written in lines of free verse and pushes the audience to listen, engage, and imagine two months, May and February, who with their reprehensible actions have made time stop. What results is represented through a chorus of humanity who dig, search, and question survival. The power of this collaboration exists here: After our first meeting, the cast presented me with a clear issue that I had been reluctant to develop—the relationship between May and February. I returned to our next meeting with a fiery scene between the two that you could not mistake as the key to their relationship. February (played by [M.F.A. 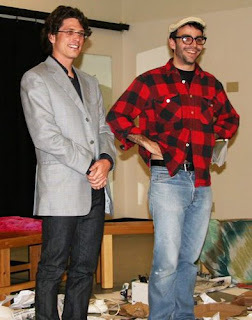 Program student] Toby Windham) and May (played by [M.F.A. Program student] Marisa Duchowny), before even beginning the scene, looked at each other and established an instantaneous bond of trust, then looked to David. David picked up what I had written, and while May and February began to tease and lead with their lust for each other, David had the impulse to create an earth-shattering quake of sound by pounding on benches. The splintering, shattering, slapping sound created an earthquake, suggesting that their actions were causing earth and time to fail. This sequence heightened my own imagination of the scene and empowered all of us to produce an intensity I could have never envisioned on my own. Through working closely with Jack Sharrar, David, and the rest of the cast, I have new tools for writing poetry and plays. By working with the various elements of writing for the stage, I continue to further my understanding of the performative qualities of language: not just how it sounds aloud, but how images, contexts, and actions come alive in crafting dialogue. I believe that creating an action on the stage leaves a residue in the memory—the sound, the action, the body, the moment come alive in a way that allows language to get at its fullest seduction. I am constantly in exploration of language and seeking ways to expand how a piece of writing can be experienced. Let It Come, Down is a play written in collaboration with the American Conservatory Theater M.F.A. Program and the California College of the Arts M.F.A. Writing Program. Collaboration continues to be an essential part of being a writer, and I hope others will continue to collaborate outside of their own genres and mediums to produce exciting new theater. The work of emerging actors and an emerging writer holds the strength that helps to keep the collaborative nature of theater young and vigorous.